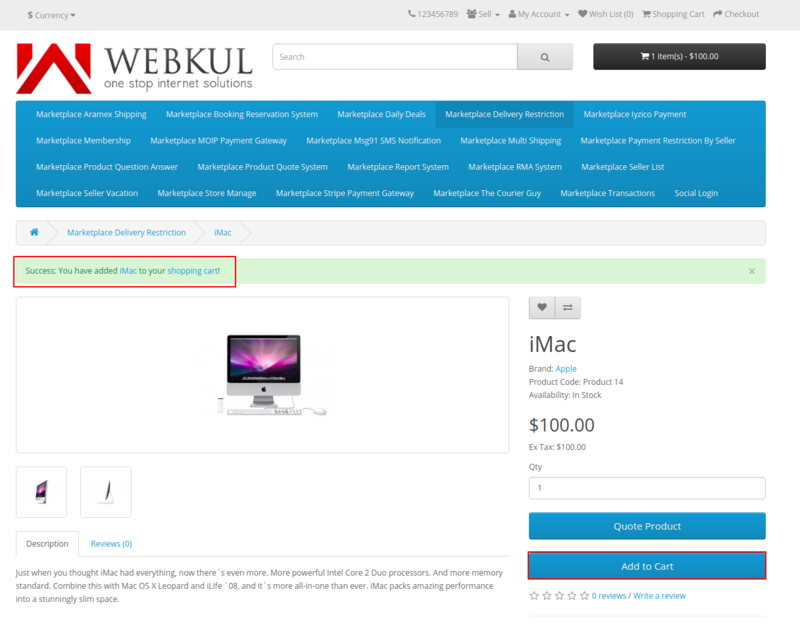 With the help of this module, the admin and the seller can easily restrict the customer to add products to cart based on the location on which the product is needed to be shipped. The admin can set shipping data according to – country, state/zone, and zip code range. 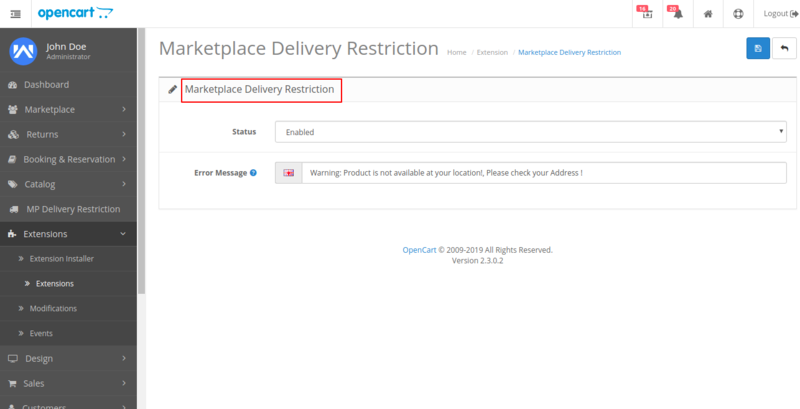 Installation of Opencart Marketplace Delivery Restriction is easy. In the mp_delivery_restriction.ocmod.xml file, the admin will find two folders, namely admin, catalog, demo, and system. The admin needs to upload admin, catalog, demo, and system folders to the root directory of the website. 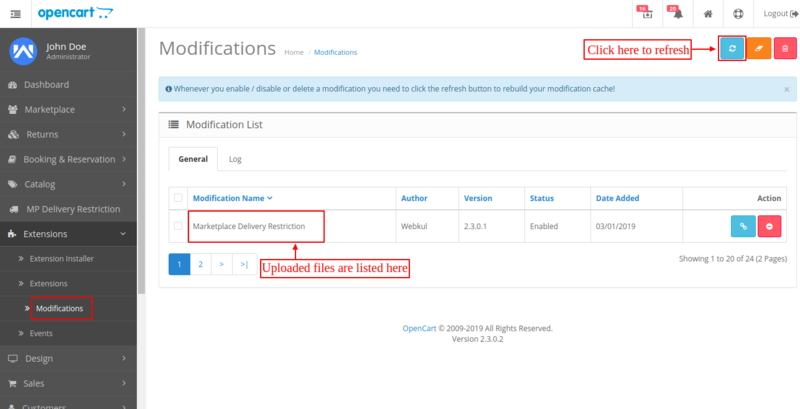 The admin can install the Opencart Marketplace Delivery Restriction module by uploading the mp_delivery_restriction.ocmod.xml file through Extension>Extension Installer. 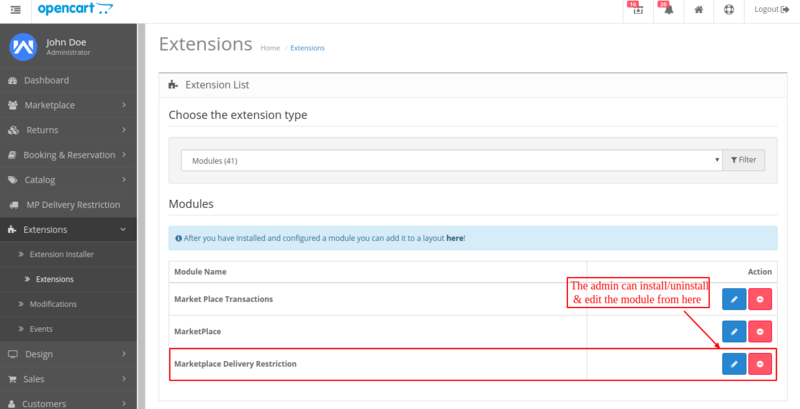 After that under Extension > Modules install the Opencart Marketplace Delivery Restriction Module as shown in the image below. After the installation of the module, the admin can click on the edit button and can edit the following module. The configuration page will appear as shown in the image below. The admin can set the following configuration from the admin back-end. Status: The admin can set the status of the Marketplace Delivery Restriction module as enabled/disabled. Error Message: This message will be displayed when the customer’s location does not match the available shipping area. After the module configuration is completed, the admin can add/edit the delivery zones for which the delivery will be enabled.The admin can even delete the delivery zones. The following page on which the add and edit option appear is shown in the image below. On adding the shipping zone, the admin needs to fill out the following information as shown in the image below. Type: The admin can enter the shipping zone in various forms as shown in the image below. Form: In this way, the admin needs to enter the shipping zone manually every time. CSV: In this, the admin can enter the multiple shipping zones through CSV file in a single go. XML: In this, the admin can enter the multiple shipping zones through XML file in a single go. XLS: In this, the admin can enter the multiple shipping zones through XLS file in a single go. The seller can also check the sample CSV, XML, XLS files by clicking on the download demo link. Country: The admin can enter the country under which the shipping zone is added. State: The admin needs to enter the state for the particular shipping zone. Zip From: The admin can enter the zip code from which the shipping zone will start. Zip To: The admin can enter the zip code where the shipping zone will end. The seller can even add the shipping zones for their respective products. 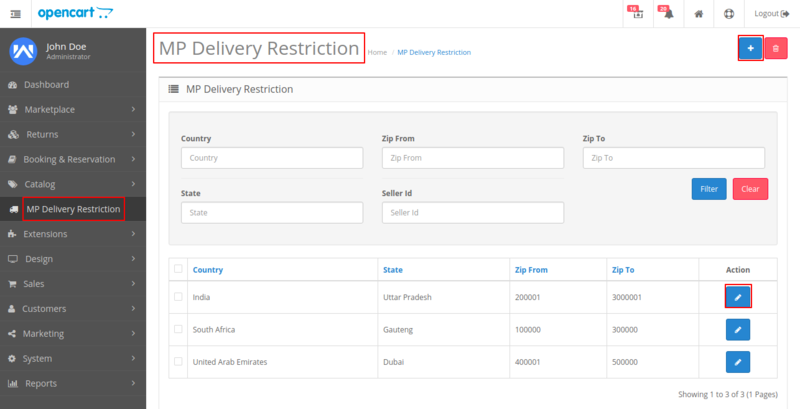 After the seller login, the seller needs to navigate to Accounts>Delivery Restriction as shown in the image below. The seller can add/edit or even delete the shipping zone for which the delivery enabled. On clicking on the add button, the seller can add the new shipping zone to the list. On clicking the plus button the following page will appear as shown in the image below. The seller can add the shipping zone through various Types as shown in the image below. FORM: If this type is selected each shipping zone is entered separately. XML: If the shipping zone is added through XML type, then the seller can add multiple shipping zones in a single turn. CSV: If the shipping zone is added through CSV type, then the seller can add multiple shipping zones in a single turn. XLS: If the shipping zone is added through XLS type, then the seller can add multiple shipping zones in a single turn. Country: The country can be added for which shipping zone is added. State: The state can be selected by the seller based on the country selected before. Zip From: The seller can add the shipping zone zip from where the shipping zone will start. Zip To: The seller can enter the end zip code which will mark an end of the shipping zone. If the customer has an address which lies under the shipping zone of the seller’s/admin’s products as shown in the image below. The customer can add the Seller’s/Admin’s product to the cart if the respective shipping lies in the shipping zone. The image below shows the product successfully added to cart. If the customer not under the valid shipping address then the customer will be notified through the custom message which is shown in the image below. 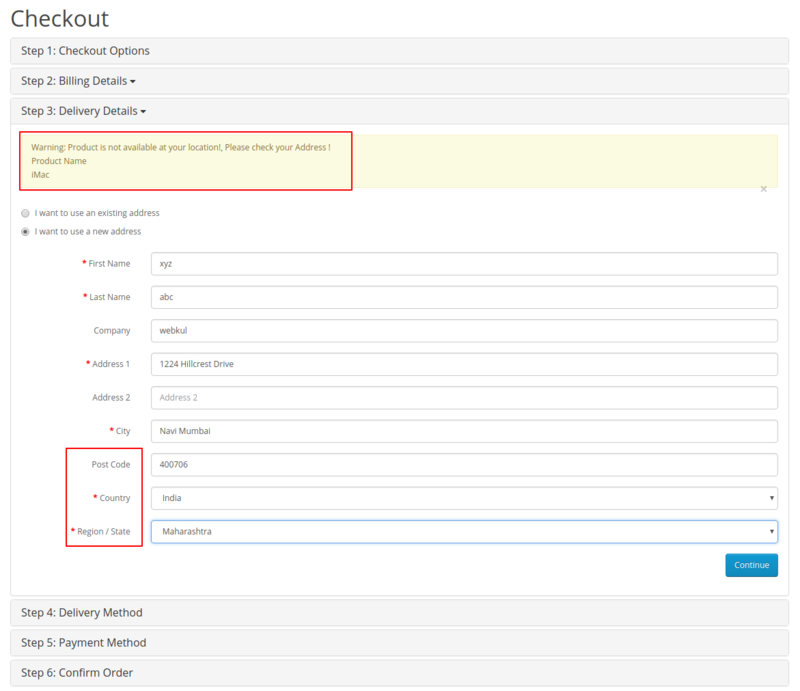 If the customer is logged in through validate default address and changes the shipping address or adds the product to cart as a Guest, then the customer will be able to add the product to cart but will not be able to make checkout. If the customer shipping address does not fall under the validated shipping zones then the following notification will be displayed on the checkout page under the Delivery Detail section as shown in the image below. 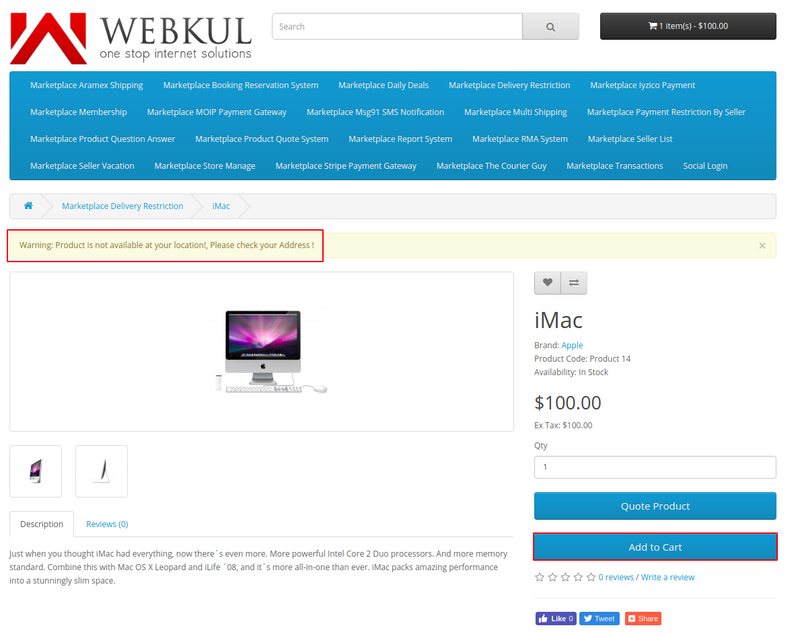 If you have any issues or requirement then please feel free to revert us at support@webkul.com.